I mentioned in my last post that the major hurdle to our Zero Waste challenge would be conquering the mountain of food that is regularly thrown away and I was right! Already this week, there have been the forgotten slices of ham that had gone into hiding at the back of the fridge and then the fresh pesto which I bought at a Farmers Market before Christmas, which had the blessing of a six week shelf-life but can only now rest in peace. Shameful, I know. ...And that's just the cold food. From the cooked menu, the bin has been fed some jacket potato skins, leftover Weetabix and some pasta. However, I have made a big effort towards the cause, even if it did involve struggling to eat a whole tub of Pesto on Saturday night and rescuing the smoked salmon from a future of being buried in the countryside. I felt ill for the rest of the evening, but the bin looked fitter! So, as you can see, the food waste issue is a real challenge and if I continue taking responsibility for eating the tubs of just-in-date food all on my own, it will be a lonesome life and one that will need the Atkins diet. OTHERS NEEDED TO TAKE RESPONSIBILITY. It was time for action. Me: So, how do you think we can reduce all the stuff that goes in the bin? Junior J: We just throw less away. Me: (thinking..."Good, he understands reduce").... Okay so what can we do differently? Junior J: Ooooh that's easy Mum, just cook more of what we like! Don't cook any more of those stinky wizard stews and don't give us any more of that yukky bread with bits in. "Us"? What did he mean by "Us"? He was sounding like a union rep! Surely that response must have been pre-planned...and what a rubbish review of my cooking skills. It's a good job I wasn't counting on his recommendation to his friends. Hmmm, but he did have a point. He was suggesting a brilliant strategy and it's not as though the boys don't eat healthily. His suggested replacement for stinky wizard stew was to have more fruity pasta (pasta with chopped apple, raisins and grated cheese), which is always popular and the ingredients are interchangeable. So I agreed to be more considerate to the junior posse's needs, but there was no way I was going to budge that very same day, not when chicken casserole was already on the menu, with a strategy to reheat it as a stew the following day! That was the plan and this was the reality. 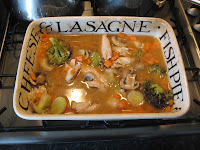 Thanks to the Love Food Hate Waste site I've rediscovered that the key to cooking with waste in mind is to find a suitable recipe for using up the ingredients in the fridge, and measuring out just enough and not too much. However, if you want to maximise the results of your efforts, make sure that you have enough food left over for another meal. The problem is I don't do recipes. A recipe for me is like telling an artist to paint by numbers rather than giving them the freedom to experiment with colour. I'm no artist but I love making it up as I go along, bunging things in and tasting on the go. My life is like "Ready Steady Cook" but using sheer guesswork. So here's my Ready Steady Cook technique: Take some chicken breasts and a selection of fresh and not so fresh vegetables (take a closer look at those carrots and you'll see that they were at their best two weeks ago). 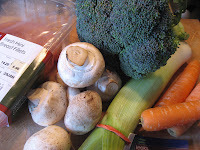 Chop everything in sight and bung the ingredients into a casserole dish with 2pts of vegetable stock, some garlic, herbs, white wine and salt and pepper to taste. Cover and cook in the oven for about 40 minutes at 180 degrees C and rescue from the oven while the chicken is still tender. Serve with rice, pasta, cous-cous or potatoes. You can see we're talking real flexibility here. However, if you prefer the painting by numbers technique, you'll find some good recommendations on the Love Food Hate Waste site. Anyway, I am pleased to report that the meal was a great success. I reduced the children's portions to avoid leftovers and what they did leave, we finished off, except for the spare rice, which was mixed with chopped pineapple and re-offered as tea. 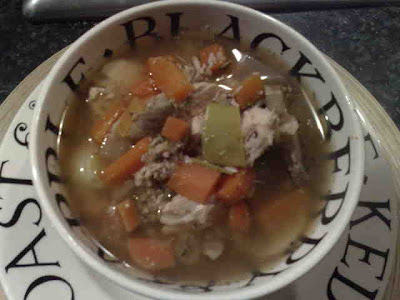 The rest of the casserole was cooled, put in the fridge and put aside ready for tonight, reformed as tasty wizard stew. Mr A was almost in denial, but I won over in the end. Last week it would have been rubbish, but tonight it was dinner. And as for the kids... they opted for baked beans and pasta. A strange mix, but at least they ate it all, so it looks like we might be on the right track. Oh yes and the bin....fingers crossed, I think it's looking thinner already. I should imagine you'd waste loads less by not following recipes. I use them every now and again, always end up buying extra ingredients, the remainder of which are never used! Brilliant idea to make an effort to use up leftover food bits in the fridge - I am very guilty of binning too many of those these days. I've got some great news Ruby. I am hoping to get some guest articles from local professional chefs on how they manage with things like this. I cannot wait to publish all their advice. in this house the standing joke is that if it is savoury it gets made into soup and if it is sweet it goes into a cake or a pudding. Incidentally PLEASE will people realise that bananas can be frozen and can be made into banana bread at a later date when u have the oven on anyway. (sadly, no good to eat raw after freezing) Also,since it is now all homgeonised and whatever, milk can be frozen. This is especailly useful to know when u are going away as, not only do u freeze the wee bit of milk rather than waste it, u also always come back to enough milk for that 1st breakfast back. Also, you can freeze yoghurts and again, use in cake/pudding recipes. (i can supply u with a couple) Really, in order to avoid waste, keep an eye on what you have and if u think u won't use it, freeze it. We do, however, spend a month 'eating up the freezer'. It's a bit of a variation on the tv game, ready, steady, cook and is always useful in a skint month. In response to anonymous' comment that bananas are not good after freezing....they are! Just chop up and mix with milk and honey for a smoothie. okay, I'm being extremely curious here; whats: pasta with chopped apple, raisins and grated cheese??? how do you do that?? Hi Esther - not sure about the email. Sorry, have had problems with the spam system recently, but will check. Now as for the pasta, it so easy and has proved so popular that many of my friends have copied it and adapted it to their own taste and not just for the kids either.